Discover the secrets behind Barbados’ finest and most celebrated golden spirit – the 300 year old Mount Gay Rum. Your first stop is to the Mount Gay Rum Brand Museum where guests are introduced to the history of Mount Gay Rum and Barbados. Into an authentic replica of a Barbadian rum shop, lights go out and the story is told. Dramatic music and video takes you through the process of making the rum. You are given the opportunity to touch and smell the essential elements (sugar cane, molasses and distilled un-aged alcohol) used in the rum making process. Perhaps the most anticipated stop is the Mount Gay Bar! 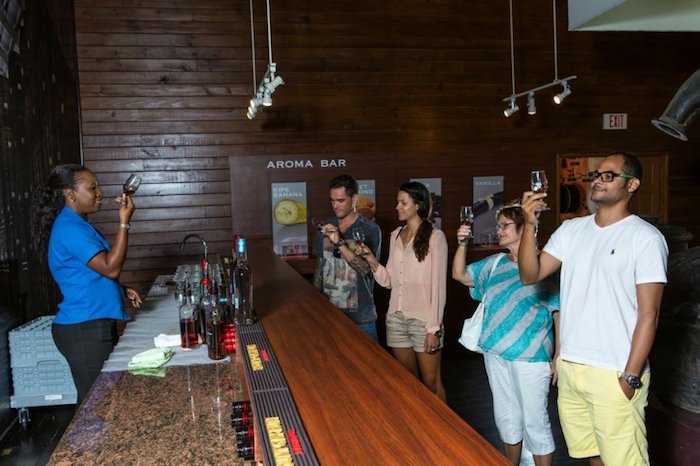 The master barman shouts “Belly Up To The Bar” and visitors are encouraged to taste the different rums and are told the characteristic nuances between the rums. The Lunch Tour is on Tuesdays and Thursdays only. A Bajan buffet is served on the outdoor covered wooden deck. Of course, lunch is accompanied by a Mount Gay Rum Punch. Before you go, pass through the Gift Shop – there’s a wide range of Mount Gay branded merchandise.